The weatherman keeps saying how much more daylight we’re getting. It’s just not that much more! By the time I found this location and started to set up, the sun was already drifting down behind the hills. 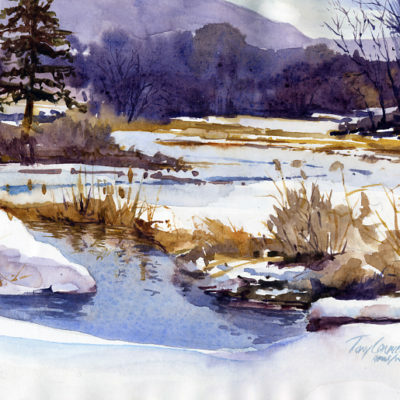 This is what we en plein air painters live for isn’t it – too little time to catch a fleeting light effect without becoming hypertensive in the process. At least in the morning, there is still light to paint by, even after the light effect has disappeared. In the evening, one loses the light effect and the light! 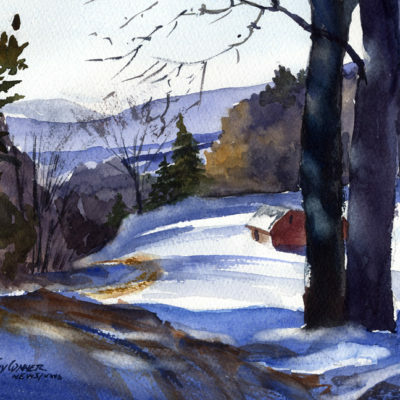 One of the things that are most attractive about the winter landscape is the stark separations of field and forest along with the rhythmic patterns they form. 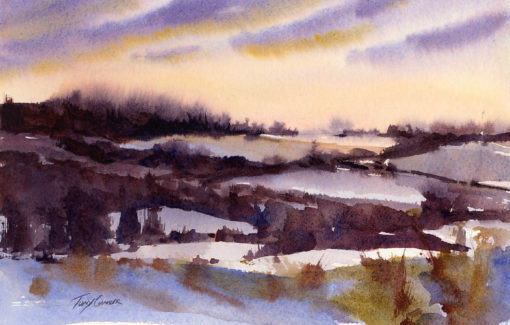 The evening sky, especially when there are clouds, tends to reflect sunset color onto the snow covered fields, changing them from blue-white to subtle warmer hues. The normal patterning that occurs in winter fields was enlivened with evening sky colors in this scene. 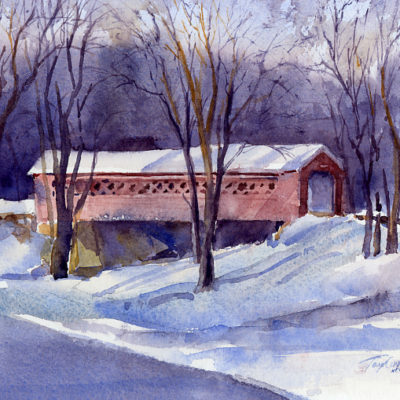 Working quickly in watercolor usually means working very wet or very dry. In this case it was both – very wet early on and then very dry back onto still damp passages.